In Atlanta’s climate, your BMW’s AC needs to be working! No one wants to be trapped in traffic in a sweltering, hot car. As cooling systems have evolved over the years, they have become more complicated and sensitive. The slightest loss of refrigerant can mean non-performing AC. Our technicians are experienced when it comes to BMW preventive maintenance and BMW AC repair. Motorcars International can get your BMW cooling properly again, and make sure that it will remain that way. Fixing a cooling system yourself is quite a daunting task. The issue could be anywhere from the electronic climate control, to the digital engine electronics module. It’s best to have a repair shop examine the AC unit as soon as there is a sign of trouble. A trained technician can diagnose and repair whatever is causing your AC not to perform. Motorcars International has all the diagnostic tools to identify the problem immediately and provide adequate information regarding your BMW’s AC needs. We offer a 24 month/24,000 mile warranty on parts and labor. So call us today at 770-691-5694 for a guaranteed repair. You can also schedule your appointment online. Keep in mind we are a Bosch Authorized Service Center & offer Stress-Free Financing for up to 6 months to qualified applicants for service or repair above $299. BMW’s have a cabin air micro filter. This filter removes dust and fine particles from the air as it is drawn into the passenger compartment. 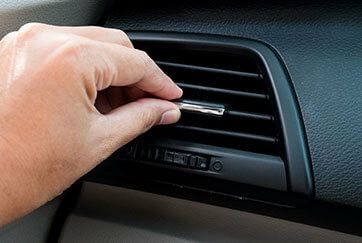 This filter becomes saturated over time and can reduce the air flow coming out of the car’s vents. Have the filter replaced once a year to keep the air clean and plentiful. Warm/Hot weather- to increase performance on hot days, select the air recirculation feature on your BMW’s thermostat controls. Instead of pulling in hot outside air and having to work hard to cool that down, your car will just recirculate the already cooled air from inside. Cold weather- run your BMW’s AC occasionally during the cold months. This will help ensure that the system stays lubricated and ready to perform its job during the hot months!